The Expo Line runs from Santa Monica to 7th/Metro Center at the intersection of Figueroa and 7th streets, with a stop at Pico — two short blocks from the L.A. Convention Center, L.A. LIVE and Staples Center. The Blue Line runs between downtown Long Beach and 7th/Metro Center at 7th and Figueroa, with a stop at Pico Station. There are free parking lots along the route. The Red Line subway runs from North Hollywood to Union Station. Parking at the North Hollywood Station and Universal City Station costs $3 a day. There is also paid parking at Union Station — it’s $8 for the day. The subway stops at 7th/Metro Center, where you can transfer to the Blue or Expo Line. The Purple Line subway runs from Koreatown to Union Station. The Orange Line busway connects to the Red Line at North Hollywood Station and has free parking in several lots. The Green Line runs between Redondo Beach and Norwalk and offers transfers to the Blue Line. There is also free parking at several lots at stations along the line. The Gold Line runs to Union Station from both Pasadena and East Los Angeles. There are parking lots or garages along the route (some free, some not), as well as street parking and paid parking in downtown Pasadena. The Silver Line runs through DTLA and has stops near the Convention Center. It also runs 24-hours between El Monte and Harbor Gateway. A one-way ride is $2.50. It costs $3.50 in stored value to ride Metro roundtrip plus $1 for a reusable TAP card. The fare includes two hours of free transfers if you need to ride more than one rail or bus line. Remember to tap your own card before each boarding, including at transfer stations. If you plan on riding Metro the entire weekend, we recommend loading additional stored value to your TAP card so you don’t have to keep stopping at the TAP vending machines. You can load up to $20 on your card at a time. 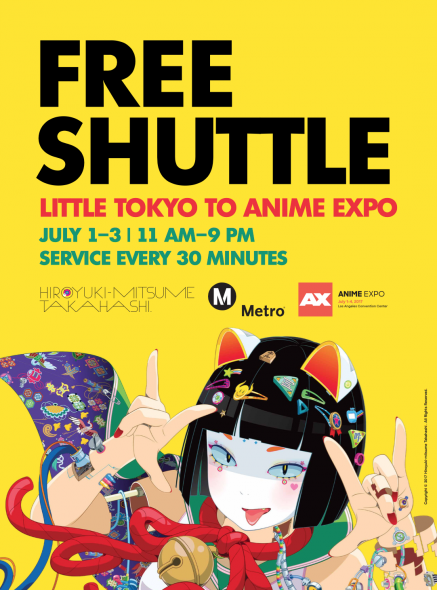 Metro will also be providing free shuttle service between the L.A. Convention Center and Little Tokyo during Anime Expo weekend. The shuttles will be in service from 11 a.m. to 9 p.m. on July 1, 2 and 3, and will stop at Miyako Hotel, Double Tree by Hilton and the Convention Center. The poster below will designate boarding location. Shoutout to Anime Jungle for helping the Metro Regional Connector team with the poster artwork! If you’re exploring the Little Tokyo area before, during or after AX, be sure to stop by the following businesses! All of them are located just steps from the shuttle stops and are offering special deals to those with AX badges. Metrolink and Amtrak trains serve Union Station, with connections to the Red/Purple Line subway to reach the Staples Center and L.A. LIVE. Metrolink has service on the Antelope Valley, San Bernardino, Inland Empire-Orange County and Orange County lines on weekends. Good job on providing shuttle bus service between AX & Little Tokyo, this is a first for that this year although Metro Local line 30 provides a one-seat ride from Pico/Figueroa to 1st/Los Angeles near Little Tokyo. When the Regional Connector is finished, there will be a one-seat train ride. Also, don’t forget to mention the Silver Line connection to El Monte & Harbor Gateway, especially now that it’s a 24-hour service. Good point! I’ll add it in, thanks. Now that the new Wilshire Grand Tower is now open to the public; they should provide shuttle service between Anime Expo and the Wilshire Grand Tower, since that new tallest building in LA is a hotel.